Connecting 3.5mm S/PDIF phono jack on a computer sound card or portable device to the Digital Coax input on a Reciever or Surround Sound Processor via a standard RCA cable. Extended the length of any component video cable with this Dual RCA female to female coupler. Extended the length of any component video cable with this Triple RCA female to female coupler. Ideal for extending your existing cable. SF Cable has a wide variety of Audio/Video adapters that converts from one connection to another, splits and join. You can get Stereo and mono connections available for most common Audio/Video connectors. 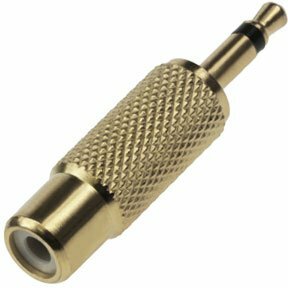 At SF Cable, you can choose from various combinations of straight and right-angled male to male, male to female, and female to male RCA plug adaptors. The extensive range of couplers is available in gold and nickel plating. All of the 1/4"/3.5mm/2.5mm/RCA Adapters are environmental friendly and come with lifetime technical support. We, at SF cable, work with ISO 9001 - 2000 registered manufacturers to provide highest quality product at the most competitive prices.